If you are still panicking about what to buy for your loved ones this Christmas or holiday season, then AFA is here to help! You can't go wrong with an animated film, so we've handpicked a list of excellent films (all released on Blu-Ray and or DVD in the past few months) that all have the AFA seal of approval. In 2016 Disney's Zootopia may have won all the awards (and come out on top at the Box Office) but the Mouse House's other feature of the year should not be overlooked. With Disney veterans Ron Clements and John Musker at the helm, it's more conventional in many ways. Yet it also feels fresh, largely thanks to its South Pacific setting, spirited lead character and a world-class soundtrack from Hamilton creator Lin-Manuel Miranda. Pick up the Blu-Ray version to make the most of the stunning animation. From the lush tropical setting, the stunning animation, the lovable lead and- of course- the year's best soundtrack, this is for my money the best Disney musical since The Lion King. This Oscar-nominated stop-motion film from Claude Barras depicts the life of Icar (known by the nickname of Courgette/Zucchini), a young boy who is taken to an orphanage following the sudden death of his mother. While that doesn't make this sound like a barrel of laughs, this French/Swiss production shows a warts-and-all version of childhood in care that is ultimately heartwarming. My Life As A Zucchini is a remarkable debut animated feature from Claude Barras. Funny and warm, yet startlingly honest, this is a beautiful film no fan of animation should miss. The standalone spin-off from The Lego Movie put's Will Arnett's take on the Dark Knight front and centre. Every bit as smart and visually inventive as its predecessor, Chris McKay's film is one of the funniest films of the year. It's also packed with geeky jokes in every frame, and references to not only Batman's extensive history but also other DC properties- and beyond. Arnett is backed up by an excellent cast too, including Michael Cera, Raph Fiennes, Rosario Dawson and Zach Galifianakis. The Lego Batman Movie is hilarious and will have you rolling your belly with laughter from beginning to end while also warming your heart with a touching story about the importance of letting others in. Makoto Shinkai's latest film is finally available to buy, and it's easy to see why it's connected with audiences around the world. While a very Japanese film in many ways, there's a lot here that's universal. The body swap story may have been done many times before, but you've never seen it like this. As with all Shinkai films, this is visually stunning, too. This is one of those movies you’re going to have to watch repeatedly to get the best out of, because the beauty of the animation is surprisingly good, not only rendered in glorious detail, but with a consistent directorial invention which even Miyazaki’s best pictures struggle to match. 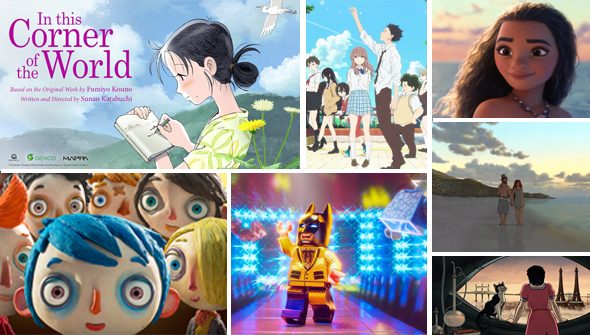 Your Name may have got the most attention (and the biggest box-office) but many would argue that Sunao Katabuchi's film was the best Japanese animated feature of 2016. Following a young woman in the Hiroshima area in the lead-up to and during World War II doesn't make it sound like a fun time. But this is often much lighter than you would think. Although things do get (appropriately) emotionally intense towards the end, this beautifully made movie is an ultimately uplifting and life-affirming one. Katabuchi's inventive yet un-showy direction leads a uniquely expressive film that seeks to find some comfort in the disorganized mechanisations of life and war. The majority of the animated features we've seen come out of France have been traditionally animated films like Ernest and Celestine and April And The Extraordinary World. This 2015 film was the first fully CGI film to be picked up by GKIDS Films for release in the US. It's a great place to start, as while the story is very straightforward, it creates a wonderfully visually inventive and unique world, that makes it well worth a watch. Naoko Yamada's visually stunning adaptation of the popular manga is not everyone's cup of tea. It certainly wasn't AFA's Mark Brandon's as his review makes quite clear. However, not everyone here at AFA feels the same way! The film depicts a teenager who tries to reconnect with the deaf classmate he once badly bullied. No mere fluff, this is an incredibly honest portrayal of teenage life that will stay with you a long time after the credits roll. If you can get over the deeply flawed protagonist and can deal with the fairly languid pace, then A Silent Voice is a highly rewarding experience. The stunning animation and rich and mature storytelling will invite repeat viewing, and ensure this is a film you won't forget in a hurry. With this film, Yamada undoubtedly stakes out a claim to be one of the most exciting voices to be working in animation today. If you've got a soft spot for classic adventure romps this is the animated film for you. Inspired by a classic French graphic novel, it takes place in a brilliantly realised alternative history 1940's Paris. Thrilling set-pieces, hissable villains, cunning contraptions and a feisty heroine, it's got the lot. It's just a shame there's no official Blu-Ray release in the UK. April and The Extraordinary World is a movie which truly lives up to its name. French animation seems to be riding a wave of success at the moment and April deserves to share in the glory. Animation fans of all kinds should do their best to seek this out... Mes amis, ce film est magnifique! When the legendary Studio Ghibli approached UK-based Dutch animator Michael Dudok de Wit to make their first international co-production you know they must have seen something special in him. It's no surprise that the resulting film is a masterpiece, a gorgeously animated, moving meditation on life that is like nothing else you've seen. Add in a stunning score and you've got a film that is truly transcendent and belongs in every animation fan's collection.